Spencer Lang returns the ball inside the Butler Bubble. Lang’s singles victory clinched Butler’s win over Xavier. Jimmy Lafakis/Collegian file photo. 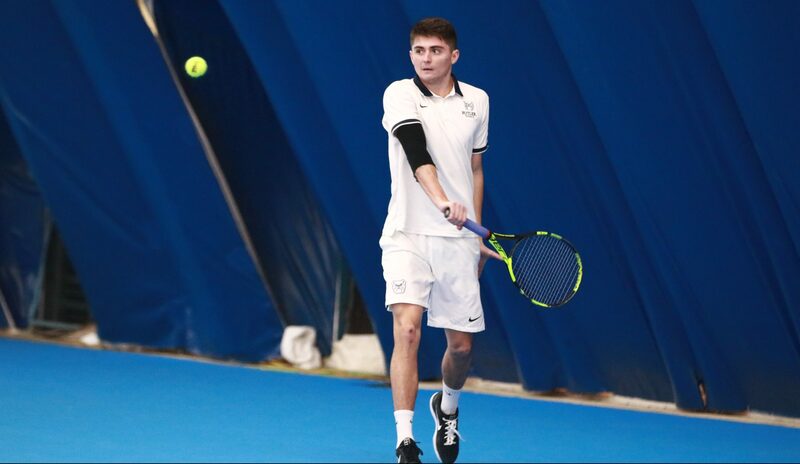 It was only the men’s tennis program who saw action this past weekend, as the women have off until their season finale against Xavier on April 12 before the Big East Tournament. The men played a total of three matches from April 3 through April 6, squaring off against Ball State, Xavier, and UIC. Against the Cardinals of Ball State, the Bulldogs grabbed their largest victory of the week, winning by a score of 6-1. It was a hard-fought battle for the doubles point to start the matchup. The Bulldogs secured the first set thanks to the Mason Dragos and Michael Dickson pairing on court 1, but a 7-5 loss in the No. 2 spot would lead to a close finish in the third match. Thomas Brennan and Ryan Roegner secured the doubles point for Butler with a 7-6 win, giving the Bulldogs some momentum going into singles play. In singles play, Butler dominated by winning five of six matches. Adrian Mag battled back from a first set loss and won the next two 6-4, 6-2 to defeat his competition. Dickson was also able to post a convincing victory by beating Ball State’s Conner Andersen, 6-3, 6-4. On April 5, the Bulldogs took on Big East rival Xavier. Despite losing the doubles point after falling in the first two sets, the Bulldogs came back to take five singles points. Brennan posted a straight-set victory from the No. 2 spot, 6-0, 6-1, making him 12-2 in that position as a freshman. Aviv Ben Shabat would follow it up with a win of his own, 6-4, 6-2. Spencer Lang would clinch the match for the Bulldogs in the No. 5 spot with a 6-3, 7-6 victory, as Butler took down the Musketeers 5-2. The Bulldogs moved to 2-1 in Big East play with the win. The next day, Butler took on UIC to close out its weekend. The Bulldogs failed to grab the doubles point in this one, losing two of the three sets. Ben Shabat and Mag were the successful duo, winning their set 6-3. Singles matches saw more favorable play for the Bulldogs, as they took four singles matches. Ben Shabat won his matchup against Kasper Parlklo, 6-1, 6-2. However, UIC responded with a win by Anthony Nguyen over Mag in the No. 3 spot. Butler climbed back from the 2-1 deficit to win three straight singles points. Dickson, Roegner, and Brennan all posted victories in their respective matches to help Butler to a 4-2 win over UIC. The Bulldogs are now 18-6 this season, with two conference matchups against Marquette and DePaul to come before the Big East Tournament.